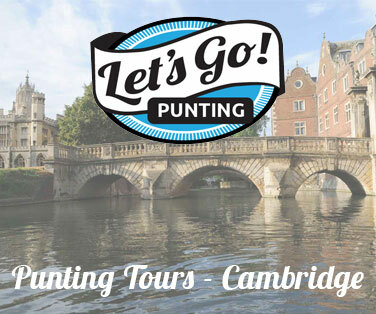 On the River Great Ouse the main boating season runs from April to November, however once those balmy summer evenings turn into blustery autumnal nights most boat owners will begin the process of winterising their craft. Winterisation is an important process to prevent damage caused by frost and inactivity and to ensure everything is well arranged for the new season. 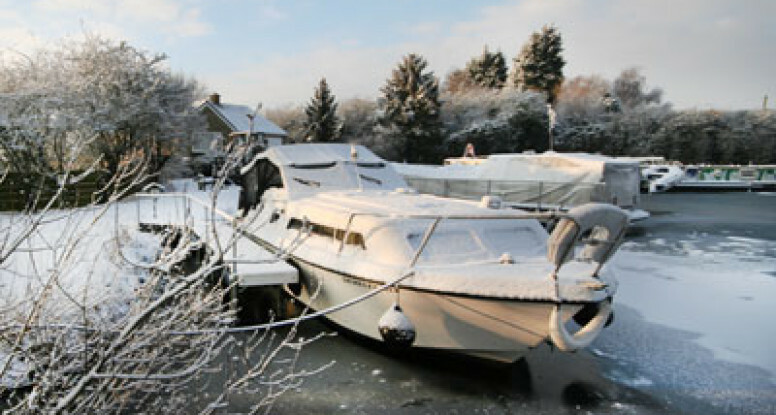 The primary function of the winterisation process is to protect boats against frost and limit the effects of condensation. It also presents an ideal time to perform some routine maintenance. Considering just a few basic points will help you judge the best winterisation process for your craft. 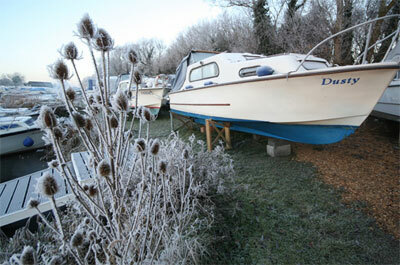 At our marina we recommend fibreglass motor cruisers are wintered ashore for 4 months every other year. This allows the hulls to dry out and helps to reduce the development of osmotic blistering between the fibreglass layers of the hull. 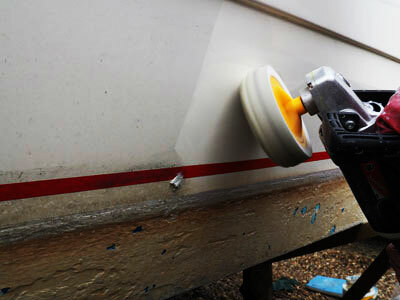 It also allows for routine maintenance such as antifouling and outdrive servicing. Osmotic blistering is prevalent in older boats from the 60’s and 70’s, where the hulls are thicker and have a ‘sandwich’ construction, surveyors tend to recommend these boats are wintered ashore annually. Boats constructed in the last 10 years are less susceptible to blistering and can sustain longer periods afloat. The winterisation process remains fairly similar for boats in or out of the water but having your boat out of the water provides the opportunity to give essential attention to areas of the boat that are usually underwater; hulls can be antifouled (see our section on antifouling for more information), GRP repaired, anodes checked, outdrives serviced, and propellers and cutlass bearings checked. Boat owners tend to spread the cost of boating by having the ‘in the water’ maintenance such as engine servicing completed one year and ‘out of the water’ maintenance such as antifouling completed the next. 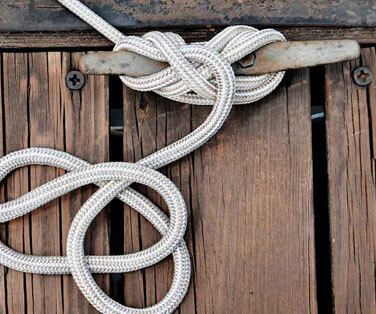 Make sure you are in contact with your marina and stay up to date with when the boats are to be lifted. At our marina we send out winterisation forms which outline the dates and costs of the various winterisation services including crane out. This affords everybody the opportunity to be properly prepared for their boat to be lifted. Once out of the water the engine is the most vulnerable part of your boat to frost damage and the most expensive part of your boat to repair; it’s certainly worth properly protecting over the winter. For this reason most people employ the engineers at their marina to winterise and service their engines. 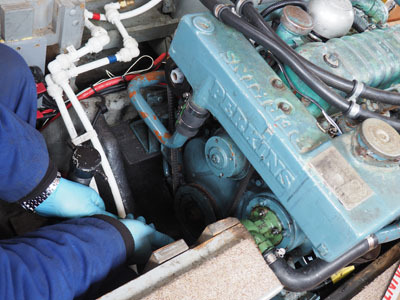 If you do decide to winterise your engine yourself you must be familiar with the requirements of your specific engine, this guide is not to be used as a reference for decommissioning marine engines. It is common to change the engine oil and oil filters on decommissioning, as it is better to leave the engine sitting with fresh oil rather than old which contains impurities and can separate out. It is recommended that diesel tanks are left filled to limit condensation. Fuel storage additives should be used in both diesel and petrol tanks to prevent deterioration of the fuel over the winter months. Directly cooled engines should be flush filled with antifreeze, draining alone isn’t enough to eliminate the risk of frost damage. This is generally done by running the engine and drawing antifreeze from a bucket or through the water filter but of course different engines vary. If you are doing this job yourself make sure you’ve researched the relevant method for your engine. For a closed cooling system the antifreeze/water mix needs to be checked and topped up with the correct ratio for winter storage and the raw water system will also need to be flushed with antifreeze in a similar fashion, once again if you are attempting this yourself make sure you are familiar with the relevant process for your engine. There is a list of potential servicing jobs that can be done at this point, another reason why it’s best to get your marina to do it for you if you’re unfamiliar. Modern outboard engines generally self-drain but some need to be drained manually. Outboard carburettors are particularly sensitive to contamination and corrosion so draining them or running a stabiliser additive through the fuel system and treating with fogging oil is advised if left unused for long periods. Outboard security can be an issue so make sure the outboard is locked to the boat, make a note of serial numbers; in our marina we remove the lower gearbox and cowling from outboards that are stored out of the water for long periods. Low power, slimline tube heaters with thermostats (the type often used in greenhouses) are becoming an increasingly popular weapon in the boat owners arsenal against frost. These heaters range from around 45 – 120 watts and are designed to keep the ambient temperature of a closed environment just a few degrees above freezing. 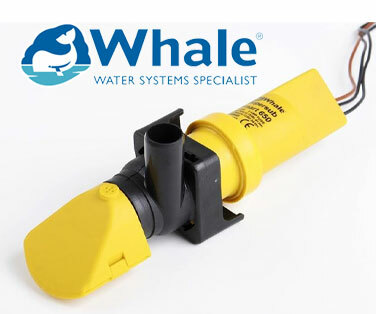 Installing one of these in the engine bay provides peace of mind for many boat owners over the winter, especially for those whose boats are out of the water and particularly vulnerable as cold air and wind completely circulate the boat. Some of these heaters come with a built in thermostat whilst others require an additional thermostat to be set at the plug. Disconnect your batteries, give them a good clean and grease the terminals. It’s best to remove batteries over the winter and store them somewhere they will be protected from the worst of the cold, they will also need regular charging. If this isn’t possible make sure they are secure on board and insulate them by laying a couple of sheets of cardboard beneath them. It is essential that batteries are kept topped up over winter, small solar trickle chargers are ideal for this job, alternatively give them a good charge every four weeks or so. As leaving the batteries uncharged for long periods will dramatically shorten their lifespan. Water systems vary greatly and to properly winterise your domestic water system you should refer to the manufacturer’s instructions for each appliance present in your system. In most cases the best strategy to avoid frost damage is to completely drain the system of water and leave it dry and open for the winter. 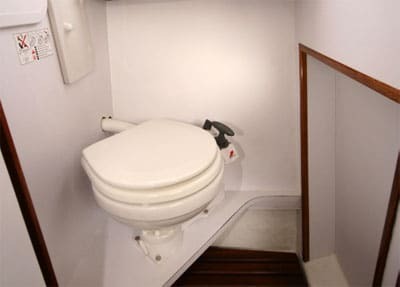 This can usually be achieved by opening all outlets on board the boat to drain the water and leave these outlets, as well as the seacock(s), open for the duration of winter (assuming the boat is out of the water). We also wet vac all taps and disconnect hoses from, shower valves, electric pumps and water heaters and vac them dry in order to allow for any expansion. 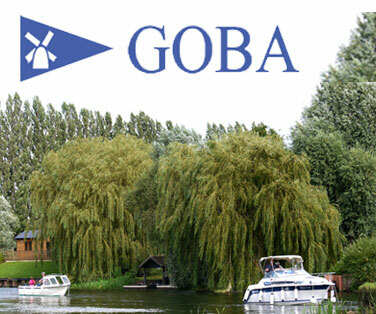 For boats with hot water systems special attention should be given to calorifiers or gas water heaters as these units are particularly vulnerable over winter. It is important there is no water left in a calorifier so it’s often a good idea to disconnect it completely from the system and physically empty them by tipping the water out but refer to the manual for full winterisation advice. Similarly gas heaters need to be carefully drained and vacuumed but differ on the technique required to do so, again refer to the manual for full instructions. 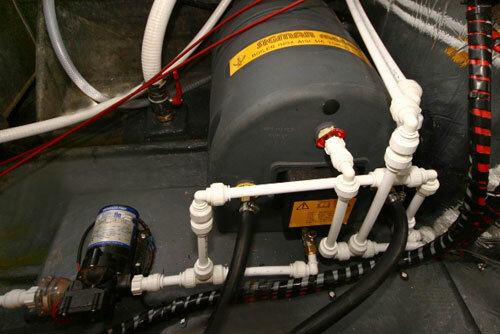 Nontoxic antifreezes are also available for domestic water systems as an alternative to complete drainage. Full instructions for winterising toilets can be found in the servicing instructions and should be referred to before attempting to drain. Chemical toilets should be removed, emptied and cleaned for storage over winter. Holding tanks should be emptied and treated with dedicated holding tank treatment and antifreeze mix. Over winter boat interiors become very prone to damp and mildew and if little effort is made inside when leaving the boat for winter it is unlikely to be a very pleasant place to return in the spring. You should aim to get as much ventilation around the cabin and cockpit as possible in order to minimise damp and condensation. Remove as many soft furnishings as possible, this includes cushions, curtains and even carpets (if possible), and store them somewhere dry for the winter. If you don’t have room to store big cushions etc stand them up on end inside the boat and ensure air can circulate round them. Make sure to leave the fridge slightly ajar, some have a catch for this purpose, and the same goes for windows, cupboards and hatches. Electric dehumidifiers are becoming lighter, more compact and more efficient. Most incorporate a humidistat which can be set to cycle on and off when the humidity inside the cabin reaches a certain level and they can often be set up to drain through a sink, eliminating the need to remove and empty the collection tray every day. 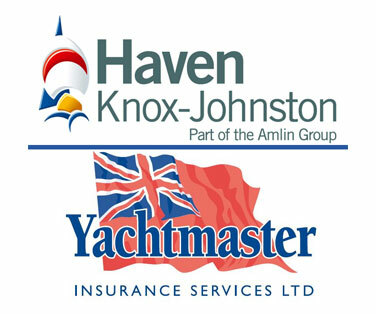 We frequently leave them on winterised boats in our yard and recommend them to our customers. Alternatively small reusable moisture traps, which use crystals to remove moisture from the atmosphere, can be strategically placed in the cabin and work well. It is well worth giving your boat a good wash and polish soon after it comes out of the water. Not only because areas previously difficult to clean now become accessible (i.e. around the water line and under rubbing strakes) but also because a clean boat is much harder for biological life such as moss and algae to get a hold on, if allowed to flourish these microorganisms will perish seals around windows and hatches. Even if your boat is staying in the water for winter giving the decks a good clean will help to keep marine life at bay and stop stains from fallen leaves setting in so severely. Lots of boat owners use tarpaulins for extra protection from the weather. Tarpaulins are used to protect hatches and windows vulnerable to leaks, shield canopies from the worst weather or in some cases completely replace the canopy which can be dry stored over winter. Properly fitted winter covers are available; however they can cost thousands of pounds and are a long term investment. We do not generally recommend all over covers as they can restrict ventilation and damage the gelcoat.